But we found that there was very little information on these subjects. To start with, researchers just do not do studies on pregnant women to see what effect a given medicine or vaccine will have on their babies. That information is gained only when the drug is given accidentally to someone who turns out to be pregnant. And many of the other questions simply had not been asked. So, we began doing our own research, starting with pregnant expatriates. We put together a questionnaire asking for pre-natal information, report of the delivery, and questions concerning other medical issues. Then we approached a number of organizations about sending the survey to their women members. In turn, many of these participants gave us the names of other expatriate friends. We ended up sending out almost 2000 surveys with nearly a 50% return. As we collected the data, we found the unexpected—expatriate women were not only filling out the questionnaire but sharing their lives–joys and sorrows regarding their pregnancies and healthcare overseas, often far from adequate. Many wrote, “I am so glad someone is interested in hearing my story.” These “stories” touched our hearts. As expatriates in Kenya, we had our own pregnancy and birth in that land not altogether a pleasant experience. The truth is, before our survey we had not met anyone else with a similar tale. While our particular situation was unique, we identified with the feelings of pregnant expatriates far from home. At that point, we knew that we would be doing more than just the original “simple” study. As a result, the Pregnant Traveler has turned into more than just a single research project. We have become an important source for information regarding pregnancy and travel. In our files we have a bibliography of hundreds of articles from the world’s medical literature, covering just about every available topic relative to the subject. And we add to this list monthly. 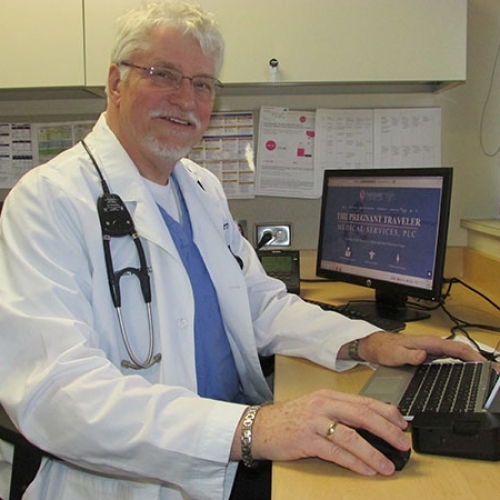 Dr. Carroll continues to publish reviews and new data in medical journals, newsletters and other publications as well as to speak frequently at international medical meetings. In addition, we continue to compile a list of qualified medical providers of obstetrical services around the world. Some of these are personal contacts; we have learned of others through the various international medical societies to which we belong. And expatriates have shared their favorites with us. We can share this information with pregnant travelers or contact these providers directly on the behalf pregnant travelers with special needs. We are always available through e-mail or our business telephone. It is our goal to be the best resource possible on travel and pregnancy and it is an ongoing project. We are always seeking “up-to-date” information on medical care overseas. If you have information (good or bad) regarding a particular medical provider or institution which you think we should add to our database, please feel free to contact us. Also, we always have some sort of research project going on. If you are now or have been pregnant in a country other than your own or have had other pregnancy and travel experiences, we invite you to let us know.